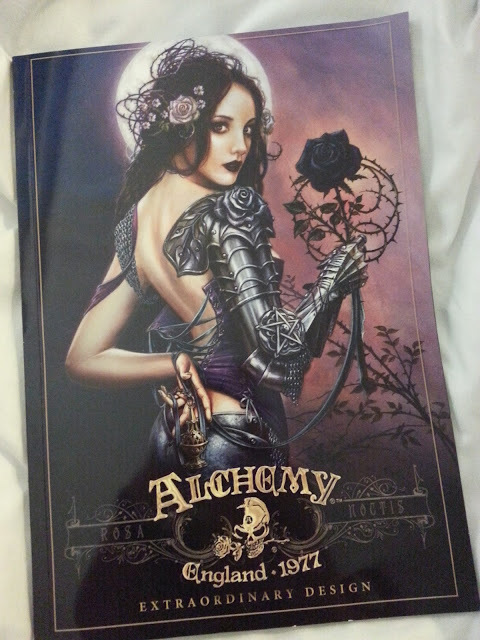 The latest copy of Alchemy catalogue arrived just as we got back from our trip to the London Edge tradeshow to view their latest collection. The amazing Pre-Raphaelite, romantic medieval themed artwork on the cover is 'Rosa Noctis'. "The paradigm of virtue, perfection and honour, as mystical and as rare as the eponymous black rose of the night, of which there is only one, and blooming just once, on the rise of the Rose Moon of June." We had the wonderful opportunity to meet the talented team at Alchemy's HQ at their open day earlier this year and see how themes from their amazing artwork is realised into the beautiful and detailled jewellery that they make. Check out their art gallery and see if you can spot the origins of your favourite piece of Alchemy jewellery was inspired from. Here is a quick peek all the new jewellery pieces from the autumn / winter 2015 releases by Alchemy Gothic, coming soon to Little Bo's Boutique. There are lots of new classic pieces for the Alchemy Gothic range, a new Steampunk piece as well as some for the more masculine Metalwear and Urban UL13 ranges. Some of our favourite pieces from this collection include the Wings of Eternity (P748 and E367), stunning Baroque scrollwork pewter ankh, taking flight centred with a black rose and accented with crystal drops with matching crystal winged earrings. With a nod to the cover art, Rosa Noctis, the Wounded Love necklace (P740) and earrings (E365) pick out the elements of the black rose and barbed thorns to make dark romantic pieces. If you loved the extravagant Bed of Blood Roses and it's little sister the Blood Rose Heart, then the Blood Heart Choker (P746) is perfect of everyday wear. A beautiful combination of pearl effect enamelled red heart, flanked by two black roses on a black ribbon to be hand tied. We also loved the whimsical Aequicorn (P743). This is a large stylised seahorse with a unicorn horn set with striking aqua blue coloured crystals. " From aequor; sea, equus; horse and cornus; horn - the preserved remains of an elusive, mythical and magical creature of the shallow seas, the mystical horned seahorse, identified by Solinus the 3rd century scholar, in his lost Classical bestiary." Alchemy, hand-crafted and British Designed and Made Jewellery is designed for those interested and daring enough to be seen and singled out from the crowd in eloquent style! Little Bo's Boutique stocks a wide selection of Alchemy Jewellery, including their Alchemy Gothic, Alchemy Metalwear, Alchemy Empire, UL13 and UL17 ranges.